V2446. 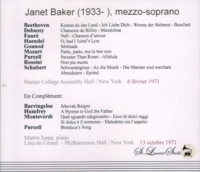 JANET BAKER, w.Martin Isepp (Pf. 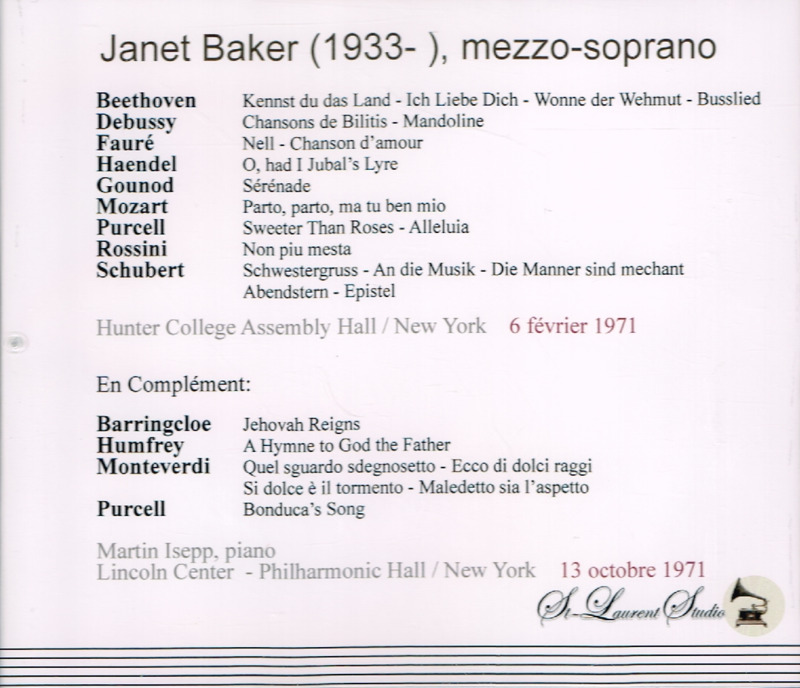 ): Songs by Handel, Purcell, Beethoven, Schubert, Gounod, Fauré, Debussy & Warlock; Arias from La Clemenza di Tito & La Cenerentola - Live Performance, 6 Feb., 1971, Hunter College Playhouse, New York; Songs by Monteverdi, Purcell, Pelham Humfrey & Mister Barringcloe - Live Performance, 13 Oct., 1971, Philharmonic Hall, New York. [Recorded independent of extraneous audience noise, this recording captures the spontaneity of the recital with no more than the occasional applause at appropriate moments, never within groups - it was a duly cultured audience!] (Canada) 2-St Laurent Studio YSL T-297. Transfers by Yves St Laurent. "The above Hunter College recital was a duly memorable occasion. Not only was Baker in outstanding voice, but her humanity transcended the footlights in this wonderfully intimate hall. No sooner had Baker begun her recital with 'O, had I Jubal's lyre' but she stopped abruptly, moving behind Isepp in order to read the text when, speaking to the audience, she commented that even performing artists sometimes get confused, whereupon she re-started the recital. [Baker’s spoken comment is not included in the recording since here it is inaudible!] At once, she had the audience in the palm of her hand." 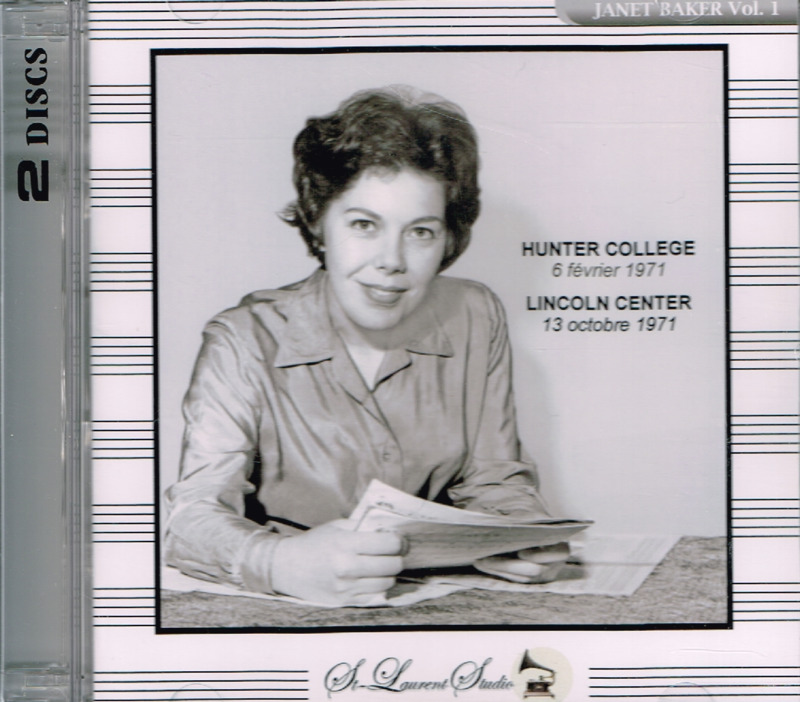 “While mezzo-soprano Janet Baker was best known for her performances of British music, especially that of her compatriot Benjamin Britten, she was also a fine performer of art song, sacred music, and Classical and pre-Classical opera. Her repertoire, as well as her background, frequently overlapped that of her great predecessor, Kathleen Ferrier; and though her career was mostly centered in England, and she always had a special place in the regard of English audiences, her fame was international. In 1956, she won the second prize in the Kathleen Ferrier Competition; that year also saw her operatic debut as Roza in Smetana's THE SECRET, in an Oxford University Opera Club performance. In 1962, she first sang with the English Opera Group, as Polly in Benjamin Britten's famous production of THE BEGGAR'S OPERA at Aldeburgh. She later credited the leading spirits of that group, Britten and tenor Peter Pears, as giving the ensemble and its singers the highest possible standards, as well as raising the reputation of British singers internationally. In 1966, she made her Covent Garden début as Hermia in Britten's A MIDSUMMER NIGHT'S DREAM, and her Glyndebourne début as Purcell's Dido. In 1971, Britten wrote the role of Kate Julian for Baker in his opera OWEN WINGRAVE, written for BBC television.